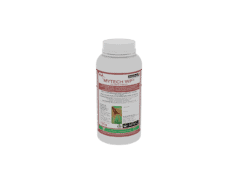 MYTECH ® WP is a biological Nematicide based on Paecilomyces lilacinus a naturally occurring Nematophagous fungus for control of plant parasitic nematodes that include Root knot nematodes, Cyst nematodes, Root lesion nematodes, Burrowing nematodes and Reniform nematodes amongst others. MYTECH ® WP is a wettable powder formulation containing living spores of Paecilomyces lilacinus at a concentration of 1.0 x 1010 Colony forming Units (CFU’s) per gram in an inert carrier. P .lilacinus parasitizes and subsequently kills eggs, juveniles, and adult females of various plant parasitic nematodes. Mix the required amount of MYTECH ® WP with water using 1 litres for every 125g product; stir well to form a uniform suspension. Add the suspension to the required volume of water in the spray tank and mix well. Add an appropriate wetter at recommended rates and mix thoroughly ( information on the appropriate wetter may be obtained from Dudutech). After mixing with water the product should be drenched/Band applied as soon as possible and washed in with more volumes of water; DO NOT store overnight. Frequency of application varies with the pest pressure and the crop. Generally it is recommended to apply, 14 days just before planting followed by a second application 4 - 6 weeks after planting and a repeat every four weeks. It is recommended to apply MYTECH ® WPTM at 125g per hectare in 1000 Litres of water followed by a further 1000 – 1500 Litres of water only to ensure the conidia are washed down to the root zone. 125g/ha, 14 days apart, 4 application then revert to maintenance regime. 125g/ha, 14 days apart, 4 application then revert to 125g 14 days apart. Augment with another product with knock down effect then 250g/ha, 14 days apart, 4 application then revert to 125g 14 days apart. For use in controlling: eggs, juveniles and females of Meloidogyne spp: Radopholus similis, Heterodera spp; Globodera spp: Pratylenchus spp: Rotylenchus spp; and Nacobbus spp. Store in a cool, dry place in a tightly closed original pack. Do not freeze and do not allow the product to undergo thermal shock. May be stored in original unopened container for six months at temperatures of 6 – 12°C.